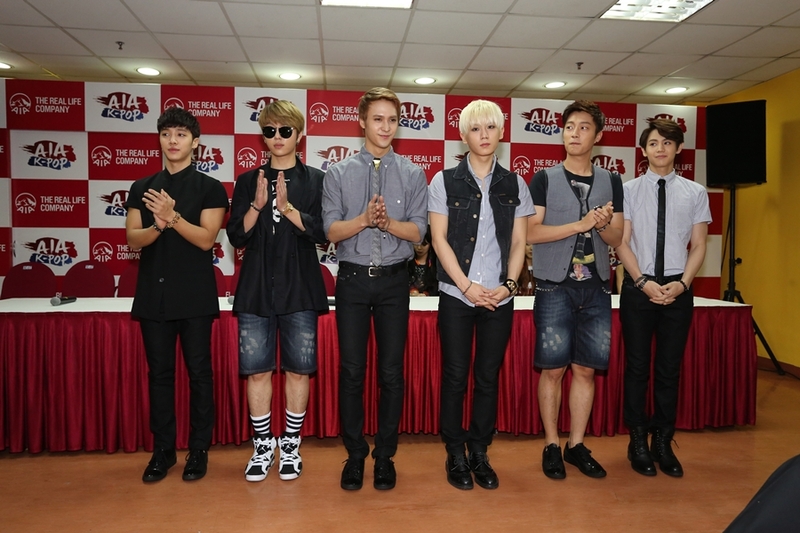 Prior from the concert, a press conference was held at the Putra Stadium, Bukit Jalil. All of the line-up namely Beast, G-Na and 4Minute were present during the meet and greet with the press. They looked so fresh and full of energy in delivering the performance later on. Below are some of the titbits from the interview. R: How do you feel about your success on the Gaon chart in May? 4Minute: The new song ‘What’s Your Name?’ was our comeback after a year. We were very nervous, but we’re happy that it has reached No. 1. We have a new release next week, which we hope everyone will love too. R: Tell us about the dance theme of your new single ‘It’s Popping’ which will be released on the 28th of June. 4Minute: The song will debut on June 28th, and we request that our fans see for themselves when the song is released. R: Are there any places in Malaysia that you wish to visit? 4Minute: I heard that the beaches in Malaysia are very beautiful, so we hope we have enough time to visit one. R : How do you think 4Minute differs from the other girl groups out there? 4Minute: Unlike other groups, all 5 of us have different personalities and characteristics, so we believe that this is our group’s unique factor. R: What have you been up to following the promotion of the single ‘Oops,’ from your latest mini album? G-Na: At the moment I am getting my next album ready. I’ll be practising, and I’ll be going overseas to visit places like Malaysia, and hopefully I’ll be able to visit other places as well to promote myself. My album will be in the making, and hopefully that will be out soon. R: Have you ever considered becoming more active in the acting scene? G-Na: Unfortunately my Korean language is not as good as I would like at the moment. So when my Korean language improves, I would love to get the chance to try acting. Trying is always good, and so I would like to try acting one day when my language has improved. R: Do you plan to visit Malaysia as part of your 2013 ‘Beautiful’ show tour, which begins in Seoul this July? Beast: On July 20th and 21st, we will be performing in Seoul for the ‘Beautiful’ tour, and we hope that we will have an opportunity to visit Malaysia in the future. BEAST: Malaysia is very stylish and fashionable, so hopefully we’ll find a chance to explore the city and do some shopping. R: Doo-joon, Gikwang and Junhyung have tried their hand at acting for dramas. Hyunseung, Yoseob and Dongwoon, are you all also interested in acting? BEAST: If the opportunity arises, we would definitely be interested in acting. Having seen the other members do so well, the rest of us hope we may also achieve such success in acting.